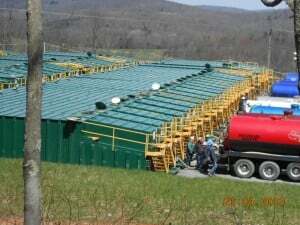 New York State Department of Environmental Conservation Commissioner Basil Seggos recently claimed that no frack waste is being dumped in New York. FACT CHECK: But since 2010, at least 23,000 barrels of liquid waste and 590,000 tons of solid waste from Pennsylvania’s fracking operations have been dumped in New York landfills. Legislators and environmental organizations called on Governor Andrew Cuomo to complete his commitment to ban fracking, and to protect New York’s clean water, by directing his Department of Environmental Conservation (DEC) to ban waste from oil and gas operations. We need your help to urge NYC to join them and ensure that this toxic waste is never used on City roads or allowed to pollute our environment. Two Pennsylvania couples were awarded $4.24 million on Monday by a federal jury, which found Cabot Oil & Gas responsible for contaminating their well water with high levels of methane. Cabot Oil had drilled two natural gas "fracking" wells near their homes.